IGM-GAL - Keeney et al. Keeney et al. (2018) present a galaxy redshift survey around 47 sight lines to UV-bright AGN observed by the Cosmic Origins Spectrograph (COS) in order to establish the connection between galaxies and UV-detected absorption systems in the local Universe. The collection of UV-detected absorption systems was released previously as a MAST HLSP ("IGM"; Danforth et al. 2016.) "IGM-GAL" releases the galaxy spectra obtained as a part of this survey for ~9,000 individual galaxies whose redshift are measured. The galaxy spectra are organized by nearest COS sight line, and for most sight lines this survey is >90% complete to ~0.1 L* galaxies within ~1 Mpc of the sight line (see Keeney et al. 2018 for details). Repeat observations imply that this survey has a redshift accuracy of 60 km/s for emission-line galaxies, 100 km/s for absorption-line galaxies, and 80 km/s for composite galaxies that show both emission and absorption. You can refer to the full collection of IGM-GAL data products using the DOI http://dx.doi.org/10.17909/T9XH52. 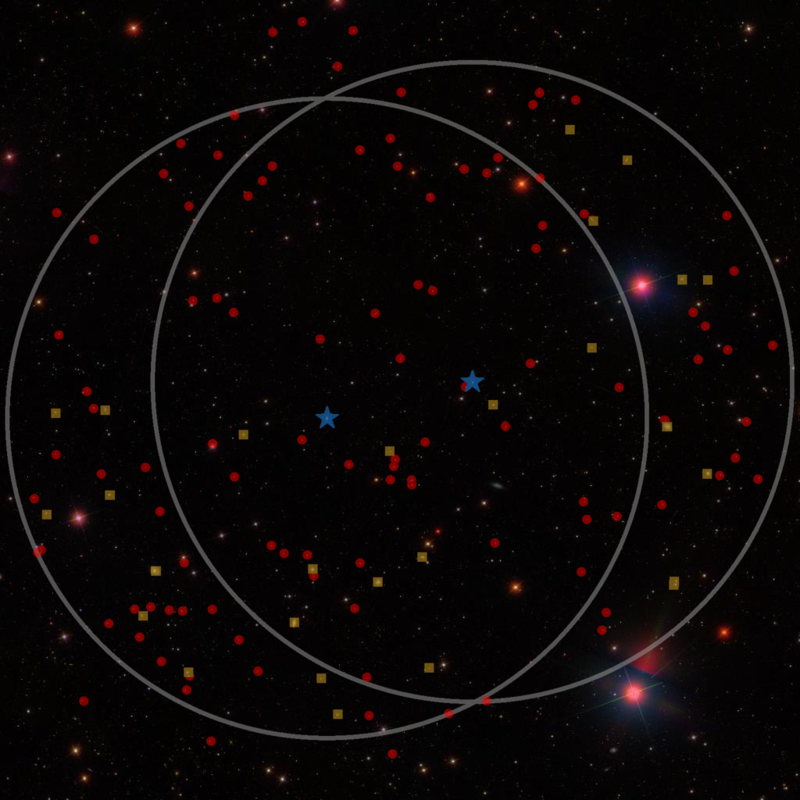 SDSS color-composite image showing the closely-spaced 1ES 1028+511 and 1SAX J1032.3+5051 sight lines (blue stars), with gray circles of 20-arcmin radius depicting the regions targeted for > 90% completeness to galaxies with g < 20. 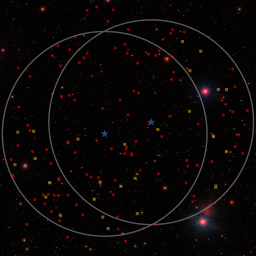 Yellow squares show galaxies with SDSS redshifts, and red circles show galaxies with measured redshifts from this survey. Note that most sight lines do not come in pairs like this one. Users may download files for a given sight line using the sortable table below. For a given sight line, click on the "Target table" link to visit a sortable table for all spectra within that sight line. A tar bundle of all galaxy spectra for that sight line is available within each of these pages. Alternatively, you can download this tar bundle containing every galaxy spectrum for every sight line (tar file is ~500 MB).